I was recently on a road trip to Kashmir and as part of my itinerary, visited a place that very few people know about; or would have heard about. 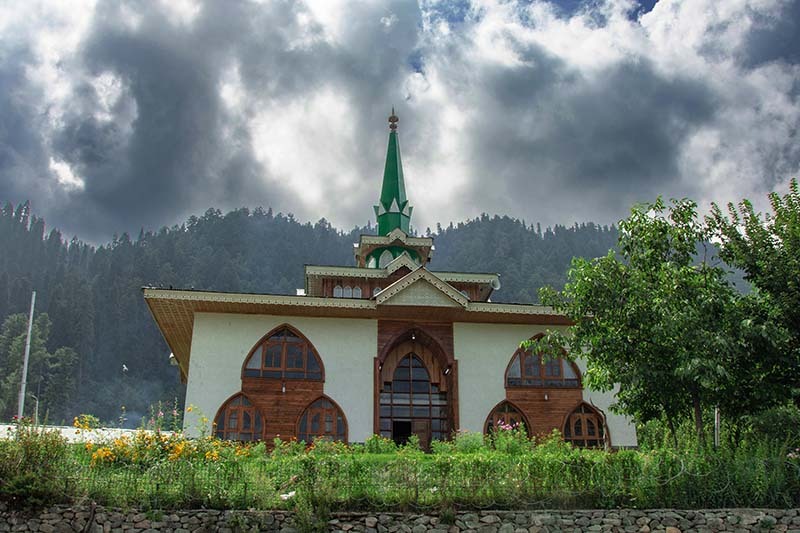 It was the Shrine of Baba Reshi, located about 6 kilometers from the famous tourist town of Gulmarg. It is not really a tourist spot and even I found out about this place only a day before my trip; while I was looking for a list of places that I can visit in Gulmarg. I did not have much information about what this place was and thought of it just as another “mazaar”. To be honest, my idea of visiting here at first was to explore as much as I can around Gulmarg and not leave any place out. Also Read: How to Plan your Trip to Gulmarg? But after I visited here and learnt more about the shrine from a close friend, I immediately thought of writing about it in a separate post. So who was Baba Reshi? The name is a pseudonym of Baba Payam ud Din Reshi, a courtier of 15th century Kashmir King Zain-ul-Abidin. Also known as Baba Rishi or Babareshi; his “dargah” now is one of the major Sufi shrines of Kashmir. Baba Reshi is said to have been born in 1411 C.E. to a nobleman. As a young man, he himself joined the court of the prince of the region as a minister; and remained so until he decided to give up all his belongings in order to serve the common people. He lived and meditated at this location which now is the site of his tomb and shrine. Also Read: When is the Best time to Visit Gulmarg? The dargah itself is located at quite a scenic location. It was built in 1480 and is located near Ramboh village in Baramulla District. Coming from Tangmarg, as you start climbing up the steep ascent towards Gulmarg; there is a road that bifurcates towards the shrine about 4 kilometers before Gulmarg. Driving through the lush and beautiful meadows, you would finally arrive at this beautiful dargah painted in white and green; built in Mughal and Persian style. Inside the shrine are some beautifully crafted wooden artworks reminiscent of the bygone era. Surrounded by lush green lawns, this shrine attracts tons of visitors each year both for its religious and historic significance. We arrived here at about 3 PM and the entire place was filled with people. They were all locals and I guess I and my friends were the only non-Kashmiris there. The huge camera hanging around my neck immediately gave the impression of a tourist and people looked at us with curiosity; or maybe amusement. There is quite a big market around the shrine consisting of shops selling balloons and toys; and several small “dhabas” and tea stalls. For people wanting to stay overnight, there is also a small guest house here. Basic amenities like an ATM machine too is available. It is a beautiful shrine built at a very scenic location and there is absolutely no doubt about it. More than the shrine however, it was the life of Baba Reshi that interested me more. It is said that one day, while he was still a minister of the court; Baba Reshi was going somewhere on his horse. On the way he noticed a group of ants working hard carrying tiny specks of grain in their mouths to their home. They were storing this food in preparation of the harsh winter ahead. This sight had a huge impact on Baba Reshi, making him realize that such a small animal was working so hard preparing for the days ahead; whereas, he himself was least worried and was not making any preparations for what comes next after death. In this world he maybe a minister, an important person, but about the next world? What was his plan for the life there? Moved by the sight of the ants and worried about his life after death, Baba Reshi gave up his post in the prince’s court and all his worldly belongings. He then came to Baba Shukruddin, seeking his guidance, and stayed with him for 2 years while training on essentials of a Sufi life. After 2 years, Baba Shukruddin sent him to Baba Zainuddin Rishi at Aishmuqam for further guidance; where Baba Reshi underwent a long and rigorous training of Sufi Path. In his later years, as instructed by Baba Zainuddin, Baba Reshi moved to the small village of Ramboh.It is said that back then, this place was highly contaminated with evil creatures which Baba helped cleanse. He spent rest of his life here helping people and performing several miracles.One such story is that the dargah itself was earlier at a higher place and people found it difficult to climb up all the way. Baba Reshi then to make it easier for everyone moved his dargarh to its current location which was better accessible. No he did not move himself, but rather moved the entire piece of land that the dargah was built on. Baba Reshi also famously built a daan, a fire place, here. Back in the day, people used to come from far to plaster this daan and offer sacrifices in order do have their wishes granted. The practice still gets followed. It is also believed that childless couples are blessed with one after praying here. If you were coming from Gulmarg, then there is a direct 5 kilometers road that bring you to the shrine. If you were however coming from Srinagar, then you will have to first reach Tangmarg. After Tangmarg, as you start to get closer to Gulmarg, there is a small road that bifurcates to your right from where, the shrine is at a distance of about 4 kilometers. Also Read: A Month by Month Breakdown of Weather in Gulmarg. There is no direct bus to Baba Reshi. You will have to look for either a private taxi or shared one. Shared cabs in the form of Tata Sumo run on the route in plenty and you will have no trouble finding one. If you were coming from Srinagar, then you can catch a bus until Tangmarg and then look for a Sumo cab from there. So if you were planning to visit Gulmarg anytime soon, be sure to include a visit to the shrine of Baba Reshi in your itinerary. Whatever the stories and you may or may not believe any of it, this shrine is definitely worth a visit even if you were coming here as a tourist. I hope that the information above was of help. If you have any other questions, please feel free to ask in the comments section below; or at our Community Forum; and I will be glad to answer. I am waiting for your Gurez expenditure do share it. You are amazing bro… Nowadays as everyone is busy in their stuffs but I always try to read your traveling experiences as soon as I get free from my work. I do have my page on Facebook and Instagram on the name of PB02RIDERS. I will be glad if you visit page and see our (Me + My Bike Riding Brothers) pictures till now. Thanks Honey Bhai. I will definitely visit your page right now.